Hi everyone – we are one day away from the start of the season!! There is a lot of important information this week – so can I please ask you take the time to read through!! We are still looking to attract new Milo participants. If you know of anyone, please let them know about Nunawading CC. On Friday 20 October, we will be running ‘COME AND TRY TWILIGHT” – where potential new participants can have a free session with no commitment! I attach a flyer which I ask if you could please circulate. The flyer will also be on the Nuna Facebook page, so please ‘like’ and ‘share’ it – so that your networks know about us!! NB – 7s and 9s training will be held tomorrow at 6.00pm. 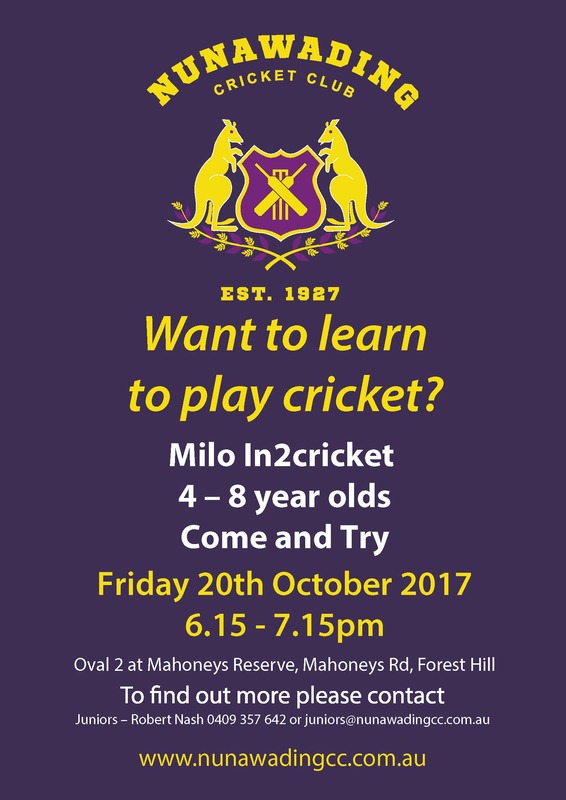 Both this training and the Milo in2Cricket program, will be held on the middle (top) oval – adjacent to the cricket nets. 7s and 9s will also have the dedicated services of Chat (our First XI player and batting coach) and will utilise the nets. Team Managers will be in touch (if they have not already) to advise exact details and venues. Please arrive at least 15 minutes earlier than the start time (or as advised by your Team Manager) to ensure you are ready to go. After matches, Milo, 7s and 9s finish tomorrow night – everyone is invited to come upstairs to our club rooms, for a cold drink, Super Burgers, Sausages and most importantly our first match report presentations. For those families new to Nunawading, this is a great occasion, and really helps bring the whole club together. It is also a great way to meet new people – and is always something that other clubs comment on – as to how we do it well. Throughout the season we will have special theme nights (ie our famous curry night) as well, to ensure variety. We are fortunate to have Piccolinos as a sponsor, so we have great pizza, pasta nights – together with other food variations. Friday 20 October, will be our Junior Season Launch. In addition to some food and a drink, we will have special presentations. More details next week. · MyCricket – the place where all cricket details are kept. This includes fixtures for matches and score results. Whilst Team Managers will advise where you are playing each week, download the MyCricket app, choose Nunawading – and then you will always know where your team is playing. · Facebook – As many will know, I am not a Facebook person – however I understand most are!! As a result, Dave Cowell and Jean-Paul Lefebure always ensure so much up to date information is on the Nunawading Facebook pages, so please join up!! If any one has any questions – or as I said, are not sure of where you are playing – please let me know ASAP.